However, the Chelsea boss was unhappy with how Everton players ‘tried to create problems’ for his striker. 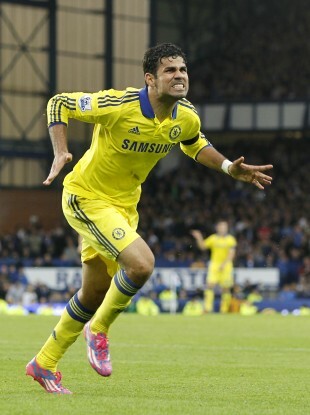 Costa scored twice for Chelsea yesterday against Everton. CHELSEA MANAGER JOSE Mourinho hailed Diego Costa as the complete striker after his side’s 6-3 Premier League win over Everton, but is concerned opponents will try to get the Spain international sent off. Brazil-born Costa scored twice in a thrilling match at Goodison Park to take his tally to four goals in three games, and maintained Chelsea’s winning start to the season. Mourinho bought Costa for £32million (€40.4million) from Atletico Madrid during the close season to add more firepower to a Chelsea side that managed 71 goals last season. That figure was far behind champions Manchester City (102) and runners-up Liverpool (101) in the last campaign, but Mourinho expects more with a lethal finisher in his side. It was the complete performance of a striker,” Mourinho said. “The perfect performance in every aspect. “In the first half he was tackling, he recovers balls, he holds the ball, and his movement was quality. Everything was really good. Mourinho was, however, disappointed with the manner in which Everton’s players attempted to provoke Costa during the game which earned him a booking. “I was not happy with the way some Everton players tried to create problems with Diego,” added Mourinho. “I don’t think it is in keeping with the Everton team, because they are positive in every aspect, to be chasing cards for a player who was here to play football. Everton manager Roberto Martinez responded to Mourinho’s criticism, adamant that Costa must learn to adjust to the different sporting ethos of the Premier League. I am disappointed if a manager is complaining about the attitude of the players,” Martinez added. “I think certain foreign players when they come to the Premier League need to understand the ethics and the culture. Chelsea took the lead with two goals in the first three minutes from Costa and Branislav Ivanovic before Kevin Mirallas pulled one back for the Toffees on the stroke of half-time. Six second-half goals saw the contest really come alive as a Seamus Coleman own goal, Steven Naismith, Nemanja Matic, Samuel Eto’o and Ramires all found the net before Costa added his second in the final minute of normal time. Mourinho criticised his side’s defensive frailties after they allowed Everton to reduce the deficit on three occasions before they found the extra bit of quality required. He added: “In training during the week we worked on defensive corners and free-kicks, so imagine how happy I am with the result of our work. Martinez was unhappy with Everton’s defensive display, although he felt it was a mind-set issue rather than the players themselves that were to blame. “It’s not the technicality, it’s the feeling,” added Martinez. “I wouldn’t be too worried about it because of the opposition. But it highlights the goals we conceded in the previous two games. “The balance is right, I thought our attacking play was phenomenal. If you look at the chances we had I think you would be surprised. “But we need to be a bit more positive at what we are good at defensively. We have over a thousand appearances in that back four and the goalkeeper. Email “Mourinho hails 'perfect performance' from two-goal Diego Costa”. Feedback on “Mourinho hails 'perfect performance' from two-goal Diego Costa”.